What technical SEO metrics matter. Link building in a post-Penguin world. Since all of us are very busy, I thought a roundup of what you need to know from the sessions covered is in order. How about it? What we can take away from conferences like SMX is not that there is an evolution occurring (that’s a given), but how the evolution is impacting the strategies, tactics and roles. We’ve been shifting away from the hyper focused tactic for some time to a more holistic view of how it impacts the bigger picture — the business goals. It’s plain to see that it’s not just those in the industry spotlight that are preaching this. There is a shift culturally in the marketing world that you can feel amongst the attendees. And with this shift, we are seeing a continuous evolution of roles, disciplines and skill sets in Web marketing. This makes it a really fun and exciting time to be a part of it all. The other theme I noticed was the conversations around content. In chatting with people around the conference, it’s apparent that people don’t just want to know what type of content they should create, but how to create content for their business that is not only “Panda” friendly, but connects with their audience from a marketing perspective. Concerns I heard echoed were: How do I create engaging content around this product I have that’s not so engaging? Or, how does a B2B create a content strategy? The foundation for content strategy can be found in traditional search marketing through things like keyword research and organic link building. And once we begin to piece together those traditional tactics, we have a path for content. What the world needs now are people who can weave all of those search marketing tactics together, and develop the quality content that users want and businesses need. Go get yourself some real writers who are strategic and understand Web marketing. Find those who can drive content strategy using the business goals, search data, sales and marketing needs. Who understand the online channels that are available and know what content works in which place. Who can measure and tweak strategy as needed. Who sees content in the bigger picture as a part of everything a business does and how it reflects branding and the user experience. This is the content marketing role. But that’s the end of that rant; how about we get on with the takeaways from our SMX East coverage? What SEO Metrics Are Truly Important? In that same session, Vanessa Fox of Nine by Blue challenged the audience to question why we track the traditional metrics we do – something that maybe not a lot of people stop to question. She said to look at the data in context to understand why something happened, not just that it happened. Ryan Jones of Sapient Nitro says you have to start with business goals like sales, conversion, leads and awareness, then pick metrics that help you measure that. Support your search data with business data to drive the strategy. 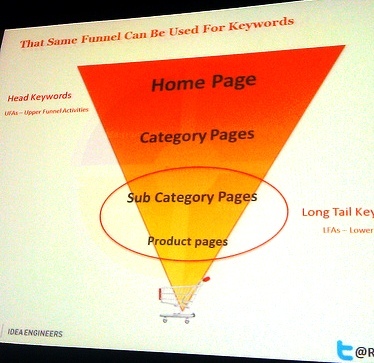 Map your keywords to your sales funnel for insight. Rob Bucci of STAT Search Analytics tells us that rankings actually aren’t dead if they are looked at with fresh eyes. Focusing on individual keywords can be myopic, but looking at the modern SERP offers rich data. And there are many elements on a SERP you can choose to measure. Just look at the way it’s laid out and all the elements that come together on the results page to offer a picture of that search query. What Technical SEO Metrics Are Truly Important? What are some of the things we should be looking at to show us we are on track? Dixon Jones of Majestic SEO reminds us to spend time in Google Webmaster Tools help section. There are hundreds of pages in this section that often say more than we think they do. Read between the lines and continue to go back over and over again. Did you know those pages are updated regularly and without notice? This is evergreening at its finest, folks. Find the gems within to help guide your technical SEO efforts. Link building is a creative process that takes a team to brainstorm concepts. Look at building networks offline to benefit your online link networks – people link to people. “Dry” topics and keyword sets can be brought to life through content that explores semantically relevant topics related to the product/service/industry. If these topics have a community surrounding it, you can build links. Keyword research that includes exploring communities using: “keyword” news; “keyword” experts; “keyword” associations; “keyword” forums; “keyword” blogs; “keyword” trade shows; “keyword” events; “keyword” classifieds. Writing unsolicited testimonials for companies you do business with. Creating a “museum” online of the history of your product/service/topic to drive people to. Building a glossary of key terms in your industry online. Follow the Schema.org page on Google Webmaster tools. It changes often without notice and offers key information. Look in your vertical (whatever that may be for products and services) to see what type of markup is being shown in the SERPs to gauge what the industry is doing. Set success metrics, and follow click-through rates; when those rates jump up or go way down, you can begin to measure rich snippets success. Stay patient. It can take up to 30 days or more for Google to start showing the markup. Learn more about the Knowledge Graph. This is an important step. For more tips from Matthew on this topic, check out our recent interview with him. Carrie Hill of KeyRelevance shared the many faces of schema markup, from reviews to location to recipes and much more. She reinforced that now is the best time to get in there and start experimenting with how markup can impact rankings. Carrie shared an interesting story: She was using her blog to experiment with rich snippet data (and her blog was a smaller blog, around 60 pages). After doing a review on a coffee maker (the only review on her blog for that product) and implementing markup for it, she outranked Overstock.com for that coffee maker. This is because Google decided it was the most relevant result for that particular brand and model. In that session, both Matthew and Carrie warned that you should choose your markup wisely and carefully, taking care not to mark up too many elements on a page or you risk slowing the site down. Use Google Page Speed tool and Structured Data Testing tool to make sure your changes are implemented well. What’s one of the most important things you should know about schema? We are in the very beginning stages, many people predict it’s going to explode, so learn and implement now before your competition does. Start with grouping the products and services a company offers. 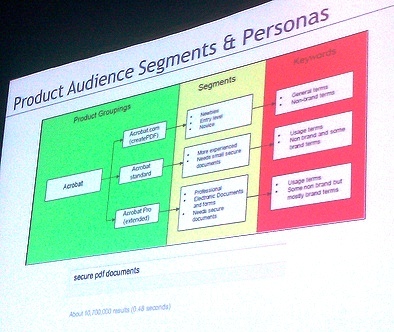 Segment audience/persona type by those who use each product. Identify the keywords each of those audience segments use. Use Alexa.com for some general demographic data about your site’s personas. Since you can’t aim Alexa at product pages specifically, you could aim it at sites that specialize in particular products/services like yours to get more data. Look at the reviews on product pages to see who is reviewing your products. Take this and see if the Alexa information matches at all. Check out YouTube to see what people are talking about surrounding the product/topic and who they are. Or you can compile data on commenters of blog posts surrounding the topic on the Web. Do you see a pattern for a persona? If you’re in the search community, now is a great time for you. As Chris Taylor of Onward Search told us, the talent for search marketing is in high demand. His recruiting firm is seeing an average salary for mid-level positions with strategic and hands-on skill sets between $60,000 and $100,000 annually. Hamid Saify of Deutsch LA talked about standing out in your search career. But one thing that stood from the session was when he spoke candidly about the fact that he encourages staff members who want to do freelance work on the side because it benefits both parties. Other panelists like Casie Gillette of KoMarketing chimed in on this topic as well, showing a growing acceptance of employees taking on work of their own outside business hours. Business relevance: Keep focused on specificity and uniqueness of keywords. You might be able to make a rating scale for this. For example, level 1 = must-have keywords; level 2 = highly relevant, unique and specific to your company; level 3 = very relevant but less precise; level 4 = everything else. Search volume: Most people start here. You can sort by volume in an Excel spreadsheet, but keep color coding on there that shows those keywords that have business relevance so you can begin to pick out the interesting keywords. Conversion: If you have PPC data, you can see how well these keywords convert very quickly. Analyze conversion volume, cost per conversion and conversion rate. Competition: Look at the competition — how many websites are displayed for that keyword? Don’t build an unrealistic strategy. You can’t be No. 1 for everything. You can certainly get there, but it can take longer depending on your competition. Searcher intent: The time that users search the most is in the beginning of the sales cycle during the awareness phase and at the end of the cycle during selection. Informational > navigational > transactional. Try to reach people in the beginning and end for more opportunities for visibility. 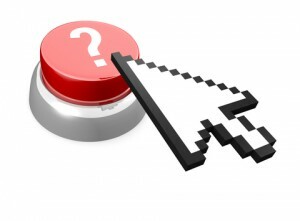 Where Is SEO Going in 2013? Duane Forrester of Bing talked about how SEO is growing up to find its place in the marketing world as a discipline that can stand on its own. On order to even call yourself an SEO these days, he says you have to have a more sophisticated, strategic outlook. You need to understand the evolution of where things are going to be proactive. Know how your content interacts in different platforms and new areas of technology so you can plan for that. To the question of: What skill sets do you need to be successful in 2013? Alex Bennert of The Wall Street Journal reminded us to think about how search supports your brand or your product. Go beyond driving traffic. And it’s still important to know the technical part of SEO to help the search engine do their job better. Also, understand mobile and how your users are going to interact differently on different platforms. Duane talked about the need to understand marketing at a basic level — the psychology of selling an object to a person. Also, the basics of SEO are non-negotiable. He plugged Matt Bailey for his ability to assign dollar values to everything, and reminded us that we each need to be able to do this within our disciplines. (Side note: check out this recent interview with Matt Bailey on Analytics in our August SEO Newsletter). Finally, he talked about the need to understand responsive design and why it’s important to the future of SEO. Scott Gardner of Bank of America gave a shout out to those who have journalistic skills from a content development perspective. Rae Hoffman of PushFire talked about how employers often expect search marketing employees to do everything, but rather than doing everything half-assed because you are trying to do it all, focus on one thing and bring ROI through that channel. … And that’s our SMX East coverage in a nutshell. You can browse through all the session here. Hope you enjoyed it, and if you have any favorite tidbits you learned at the show, please share in the comments below. If you’re interested in peeping some pictures from the show, check out our SMX East 2012 album on Facebook! There is so much to learn to stay current with SEO. Your summary of the SMX East 2012 is very informative! Your easy to understand format with links to additional information is much appreciated. Great summary, even though, I wasn’t there I actually feel like I got the highlights. Thanks for sharing.